The Kalachakra is an elaborate system of astrology in itself and would take voluminous books to explain fully. 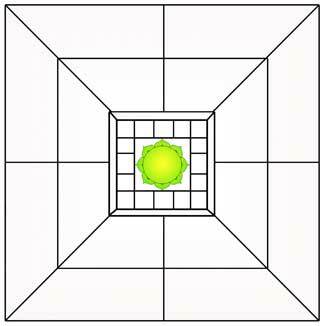 This chapter is just introducing the subject and bringing to use certain techniques to show the depth of the use of the nakshatras. It is important for the fuller understanding of the foundations of the nakshatra’s use and categorization. The Kalachakra is an elaborate system of Tantric astrology. Simple uses are mentioned in common texts like Prasna Marga and Jataka Parijata, but there is an entire Tantra written called the “Kalachakra Tantra”. This tantra is composed of five books. The first book is on the outer Kalachakra and has the large amount of Jyotish information. The Kalachakra is a wheel of time, almost a calendar in its self. Literally, Kala means time and Chakra means wheel. The second chapter is related to the inner Kalachakra and related to the nadis (energy channels) and movement of prana relative to Jyotish. The third book deals with tantric initiation into the Kalachakra path and the fourth and fifth books relate more to sadhana and meditation. The Tantra was translated a few hundred years ago into Tibetan and parts of the Tibetan text have been translated into English with Tibetan Buddhist commentary. There has been no direct translations from the original Sanskrit to English as of yet (2004). There are 722 deities contained in the Kalachakra (720 plus Siva and Durga). These relate to the ‘72,000’ nadis mentioned in the hatha yoga texts, as well as the 720 sashtiamsas of the D-60 regarded as the most important varga according to Parashara. There are 78 deities on lotuses counted twice with their consorts (78 x 2 = 156). And with 6 seal implanting deities there are 162 main deities in the Kalachakra that are said to relate to 162 main channels in the body. In the same way they also relate to astronomical aspects. In the outer level (body mandala) there are 2 Adityas in each of the 4 directions, and 1 Aditya in each of the intermediate directions. This adds up to the twelve months of the year. Each Aditya is embracing their consort and surrounded by 28 deities, that represent the 30 days in a month, and all added together the 360 degrees of the zodiac and sidereal solar year. Prasna Marga of Harihara teaches some techniques of calculating death with the Kalachakra and the 8 Yoginis. There are exactly 36 verses listed in Prasna Marga on the Kalachakra. 36 is the maturity of Saturn, the ruler of longevity and death. The life cycle can be broken down into 3 sections of 36 which add up to 108. When jyotish longevity calculations give the result of short, medium or long life, they are referring to these three cycles of 36. There are five techniques for determining which third of life a person will die. These are related to the panchatattvas (5 elements). Once the section of longevity is calculated, the next step is to see when within that frame of time will the person meet their death. This is done with various methods like Shoola dasa, Navtara chakra, and the movement of the Yoginis in the Kalachakra, etc. The Kalachakra will also show the health of the native and especially times of sickness. It shows how a person uses their pranas (energy) and the directions in life this will lead them. The natal chart is mapped into the Kalachakra to be read. Prasna Marga gives a verse for the drawing of the Kalachakra diagram used in Jyotish. AaiÉij*u®tStara> SwaPya> Syu> sÝ sÝ g[naw!.83. @v< pun> àvezae ingRmn< àae®tv½ g[nimh.84. 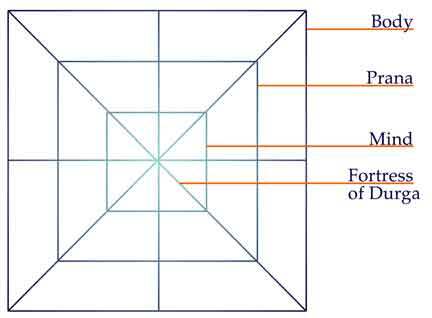 The 1st nakshatra starts at the center of the top horizontal line, in the diagram there is the number one. The Kalachakra has multiple ways to be set up, but for primary purposes use the janma nakshatra called the birth star, which is the natal Moon’s nakshatra. The Kalachakra is a 28 nakshatra system so add 1 to any nakshatra over 21 in the 27 chakra system. The Moon takes 27 days and 7 3/4 hours to transit the 360 degree zodiac. The 27 nakshatra system averages this to 27 signs each having 13 degrees and 20 minutes of arc. 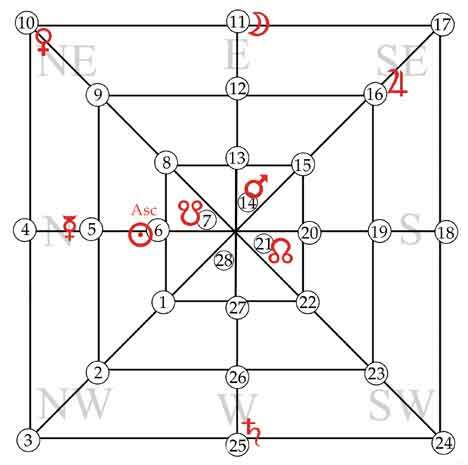 The 28 nakshatra system calculates the remaining 7 hours and 38 minutes into a sign called Abhijit which is 4 degrees 14 minutes and 13 seconds of arc. Abhijit is calculated from 6-40 to 10-53-20 Capricorn (or 276-40’ to 280-54’-13”). There is a diagram at the end of this article if needed. Human beings are made of three external things: Body, Prana and Mind. This can be seen in the Kalachakra as the external layer, the middle level and the internal level. The outer body layer is often referred to as the Exalted Body Mandala. 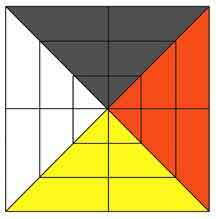 The middle pranic level is called the Exalted Speech Mandala. The inner Manas level is called Exalted Mind Mandala. The innermost section of the Kalachakra is called the Fortress of Durga. It can be divided into three main sections. There is the Mandala of Exalted Wisdom and the 16 squares of the Mandala of Pristine Consciousness. Then the inner most center is the Mandala of Great Bliss. In this center Mandala there is a green eight petalled lotus which is the seat of Durga as Vishvamaata who is saffron colored with 4 faces and 8 hands. She is in embrace with Siva as Kaalachakra. Sri Kaalachakra has four faces and twenty-four hands. What is visible is what is outside, on the outer level. The Moon is always visible, like the conscious mind always seen. So the birth star with the Moon start the Kalachakra. The Moon is placed where you see the number one in the above diagram. Other planets are placed in their respective nakshatras. There are other techniques than the one I will be demonstrating that use different configurations. The Moon in the East is aligned with the natural Sun and therefore shows the pranas in the body. The moon in the North East shows the manas (as the mind is always under the influence of Rahu). Sometimes the Sun nakshatra is also used starting the sequence from the North East direction; this is used to see evils in the chart. There is also another system used for receiving knowledge from and about the devas. In this Kalachakra the Nakshatras will go in a counter clockwise order. Software is not needed as long as one knows the planet nakshatras. For those using Jagannath Hora software which calculates the Kalachakra with the Sun as the base nakshatra. Right click and chose [change base nakshatra]. Then select [use the following star as the base instead]. Then select the jamna nakshatra of the native you are calculating. The following is an example using the chart of the Dalai Lama. The Moon is in Purva Phalguni which is the 11th nakshatra. Therefore the Kalachakra starts with 11 and goes from there forward. The Moon is on the top middle horizontal line in Purva Phalguni. The Sun is in Ardra nakshatra, which is the 6 th star and therefore you see the Sun placed next to number six which represents Ardra. Mars is in Chitra which is the 14 th star and so Mars is placed within the Fortress of Durga by the number 14 representing Chitra nakshatra. Other planets and sphuta (points) are placed accordingly. Next one needs to understand the deities that the energy is coming from or going to. For example, energy going to Agni is good as it leads to health and spirituality. 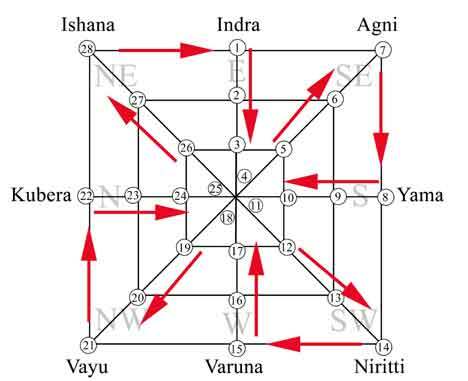 Energy going to Nivritti, the Rakshasi, is bad. It is energy being used for demonic purposes. In this way, by understanding the deities, the use of prana is determined.